Marussia F1 team have confirmed that they will not take part in next weeks test after their Chassis failed the FIA Crash Test. The team who had run the 2011 car for the first two tests held the FIA crash test today (Monday) and have announced that they failed to pass the test. “The Marussia F1 Team is disappointed to confirm that the planned first test of its 2012 race car – the MR01 – has been delayed as a consequence of not passing the final FIA crash test.” Marussia said in a statement. Venezuelan Pastor Maldonado has amazingly topped the time sheets today at Circuit de Catalunya in Spain. The driver who is entering his second year in the sport, drove for 106 laps today, and that was more than enough to earn him top spot by nearly a full second. He also beat the previous fastest testing time (Held by Nico Hulkenberg) by 3-tenths of a second! In 2nd place was Michael Schumacher. Schumi brought the MGP WO3 around in a lap time of 1.23.384 after 127 laps. In 3rd place was Saubers Kamui Kobayashi. The Japanese driver completed 99 laps of the Circuit de Catalunya in which he set a fastest lap time of 1.23.582. Jenson Button in the MP4-27 was fourth overall. The Brit who came 2nd in last years championship and is expected to be Vettels number one rival for this year, brought the car around in 1.23.918 and racked up 114 laps. Toro Rosso’s rookie, Jean-Eric Vergne completed 78 laps during the day during which he set a best lap time of 1.24.433. Mark Webber took over from team mate Sebastian Vettel today and came in 6th. The Aussie completed 97 laps of Catalunya, but suffered from a Gearbox problem for most of the day and failed to extract the full potential from the car. He achieved a best lap of 1.24.771. Felipe Massa driving for Ferrari completed 84 laps and achieved exactly the same time as Mark Webber in 6th place – 1.24.771. In 8th place, Paul Di Resta completed 83 laps with a fastest lap of 1.25.646. In 9th place was Timo Glock for Marussia who achieved a fastest time of 1.26.173 after 108 laps. Russian Vitaly Petrov in the Caterham brought up the rear with 1.26.448 after 70 laps. Lotus and Hispania did not compete in the tests. Lotus withdrew after a problem with their chassis and Hispania did not come to Catalunya because they have still not passed the FIA Crash tests. Just a reminder, The testing times are not to be taken as a good guide to the teams. The teams are completing various tests and may be sandbagging to not give away their real pace. German driver Nico Hulkenberg has continued his strong form by topping the timesheets in Catalunya. The driver who is returning to F1 with Force India, after spending a year as a reserve driver, was 2nd fastest in yesterday’s test. Today, he completed 112 laps and set a fastest lap time of 1.22.608. In 2nd place was Sergio Perez in the S31. The Mexican driver racked up 85 laps with a time of 1.22.648, just .040 off Nico Hulkenberg. In 3rd place was defending world champion Sebastian Vettel. The German who topped the time sheets yesterday completed 104 laps of Catalunya before setting a lap time of 1.22.891. Lewis Hamilton in the MP4-27 for McLaren completed the most laps of anybody today – 120 laps – but could only manage sixth place with a lap time of 1.23.806, 1.2 off Hulkenberg’s fastest time. In 7th place, Nico Rosberg brought the MGP WO3 around Catalunya in a time of 1.24.555 after 82 laps. Behind Rosberg was Williams test driver Valtteri Bottas in eighth. He completed 117 laps of Catalunya with a fastest lap time of 1.25.738. In ninth place is Vitaly Petrov who was confirmed at Caterham last friday. The russian had a short enough day and only ran 69 laps. After the session, he had secured a time of 1.26.605. 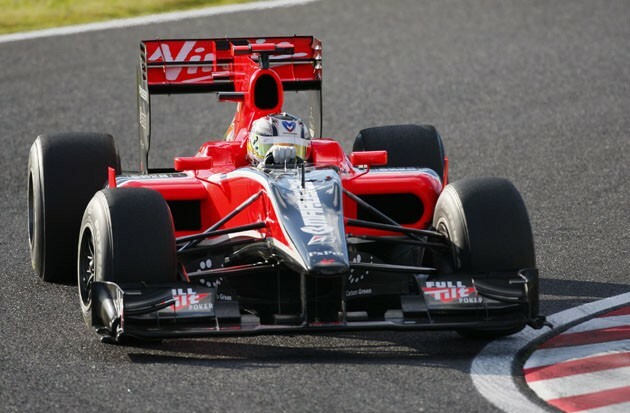 In last place for today was Charles Pic in the Marussia. He was running the 2011 car as they still have not launched the 2012 car. Hispania and Lotus did not take part in the test. Hispania have yet to pass the FIA crash test after failing halfway through testing at Jerez. Lotus have a problem with the sidepods and have withdrawn from Catalunya to fix them. Defending world champion Sebastian Vettel has topped the time sheets as the 2nd pre-sesaon tests begin. The Red Bull star completed 79 laps to achieve a top time of 1.23.265. In 2nd place was Nico Hulkenburg in his return to F1 in a Force India. The German completed 97 laps which was enough to beat Lewis Hamilton in 3rd. The 2008 World Champion racked up 114 in his MP4-27 in which he achieved a best lap time of 1.23.590. Fernando Alonso was next in the ferrari. He completed 75 laps, one less than the man ahead of him and secured a 1.24.100 lap time. Seven time world champion, Michael Schumacher was 6th in the MGP WO3. Throughout the day, he racked up just 51 laps and this earned him a 1.24.150 lap time, just off the Ferrari of Alonso. In 7th place was Sergio Perez for Sauber. The mexican brought his car around 66 laps of Catalunya and at the end of the day, his best time was 1.24.219. Bruno Senna in the Williams was next. He competed 97 laps during the day and brought the Willaims up to 8th out of 11 on the time sheets. Heikki Kovalainen driving for Caterham followed Senna. Kovalainen completed just 31 laps in the CT-01. Romain Grosjean completed 7 laps before a problem with the sidepods caused Lotus to abandon the week of testing. In 11th was Charles Pic with 121 laps. Hispania did not have a car at the track as they still have not passed the crash test. Russian driver Vitaly Petrov has replaced Italian Jarno Trulli at caterham, the team said on friday. Petrov was dropped by Lotus (Renault) At the end of 2011 in favour of Kimi Raikkonen and Romain Grosjean and failed to find a seat. There was much speculation a few weeks ago that Petrov would by the seat from Trulli but Jarno repeatedly assured the press that his seat was safe. The Russian was at the team’s factory in Hingham on Friday for a seat fitting ahead of his first run with the team at the second pre-season test in Barcelona next week, Caterham said. “We are all delighted to welcome Vitaly into our team and are very excited about the role he will play in helping us take the next steps forward in 2012 and for many years to come,” Team principal Tony Fernandes said. The Formula one season gets underway in Australia on 16th March. Official Formula One tyre supplier Pirelli have announced the tyre compounds that will be used by all twelve teams in the season-opening Australia, second round at Malaysia and third round at China. For Australia and China, The slick tyres will be White Medium and Yellow Soft compounds. For Malaysia, Pirelli will supply Silver Hard and White Medium. There are four possible slick compounds, Silver Hard (Most durable), White Medium (Less durable), Yellow Soft (Even less durable) and Red Super-Soft’s (Least durable). Pirelli decide what tyres are used based on tyre characteristics, the track and predicted temperature. There is no choice in wet tyre choice, with the Green intermediate’s and Blue full wets. On Charles Pic’s 22nd birthday, Ben Sweeney’s F1 Blog looks back on his rise through the feeder series. Usually on a drivers birthday, we write an article on their F1 career such as Jenson Button or Rubens Barrichelllo, but hopefully next year we can write a new article about Pic in F1 and his hugely successful 1st season! Enjoy. Charles Pic was born on 15 February 1990 in Montélimar, France. He is the brother of Eurocup Formula Renault 2.0 driver Arthur Pic. Charles had a successful run in Karting with him winning some races and minor championships. He came close to winning the European Championship ICA Junior. In 2006, Pic raced in the Formula Renault campus. He finished 3rd overall. Pic raced in the Championnat de France Formula Renault 2.0 (Where he finished 4th) and the Eurocup Formula Renault 2.0 (Where he finished 3rd) in 2007. In early 2008, he was signed to Formula Renault 3.5 team Tech 1 racing where he raced alongside fellow french-man Julien Jousse. Pic finished the season in 6th place with 69 points and two wins, Le Mans and an amazing performance at Monaco where he dominated the whole weekend. He stayed with Tech 1 for 2008 and also joined the Renault Driver Development programme. He had a slow start to 2008 with a retirement in the first race but he recovered and secured two race wins, at Silverstone and Nurburgring. Pic finished 2009 3rd overall with 94 points. In 2009, Pic graduated to GP2 Asia with Arden International, stayed with them for two years and continued with the team into the 2010 GP2 Series season. Pic claimed his first victory for the team, winning the sprint race of the first Bahrain round and also won the first race of the main 2010 season at the Circuit de Catalunya. He finished tenth overall with 28 points. For 2011, Pic moved to Barwa Addex team where he partnered dutch Giedo Van Der Garde, who is Caterham’s reserve driver for 2012. He didn’t score points in the Asia series but he scored a main series win at Catalunya, leading home team mate Garde for a 1-2 for the team. He won in Monaco which moved him up to 3rd place in the championship. He qualified on pole for Valencia but retired from both races and dropped back in the championship. He finished the season in fourth place with 52 points, 3 points ahead of Garde. In November 2011, He took part in the young driver test at Abu Dhabi for Marussia Virgin racing. After the 2011 Brazilian Grand Prix (Which ended the F1 season) It was announced that Pic would replace Belgian rookie Jerome d’Ambrosio for the 2012 season. He will drive the number 25 car and partner German Timo Glock.